What makes a first-year law students heart skip a beat? The inevitable cold call. The Socratic method. Random participation No matter what you call you, you will encounter it in law school. They are no fun but like any skill, they grow easier with time. Professors in law school teach using a question and answer style that is meant to make you learn skills such as speaking in front of a group, thinking on your feet, handling tough questions and processing case information. The questions vary by professor- some are tough, some are more forgiving. Generally, they will call on your to recite the facts of a case or the issue and then continue on with the rest of the case issues or additional reading material. Sometimes they will call on you about something you have previously learned as review. You never know what questions will be asked so be prepared for anything. The professors will use a method of calling on students to discuss the cases you read for homework. 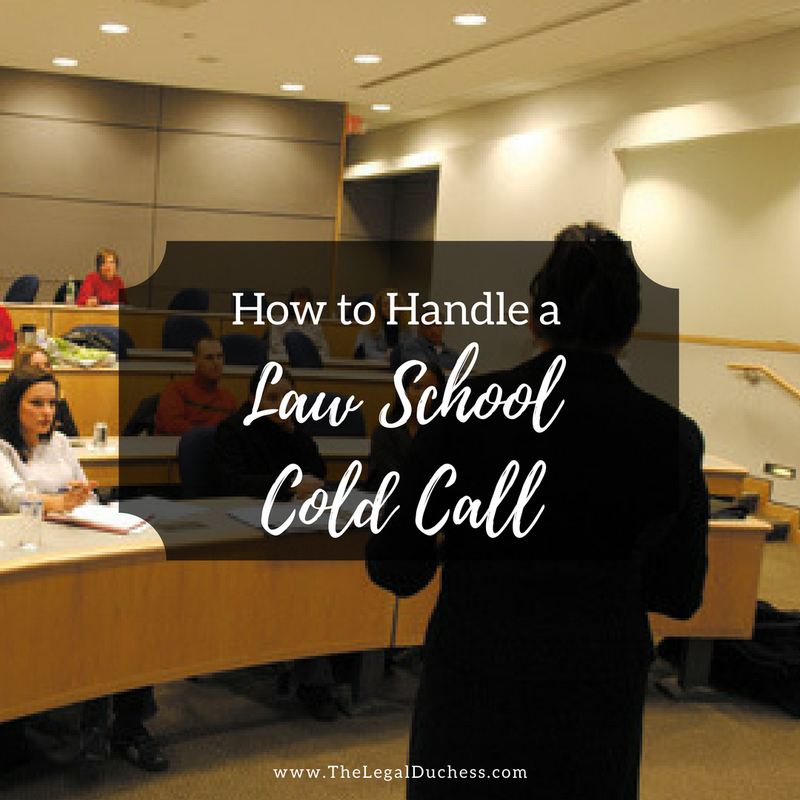 Some professors go down the row, some call randomly from the seating chart, some tell you ahead of time if you will be on call next class, some call on you within a group or team; no matter the method, you will likely be called many times throughout your law school career and handling cold calls are a skill you need to acquire. Don't show up to class unprepared. Just don't be that person. If you have not done your reading, you will be embarrassed on a cold call. Just read. Trust me, it's the lesser of the evils. Do your reading, take notes (briefs or book briefs) and do a quick recap before class to make sure it is fresh in your mind. 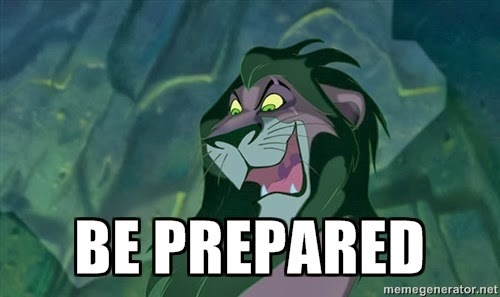 If you want more help on preparing for class, check out this post. But like I said, be prepared for class. Post this little meme over your desk if you need a reminder. Do not be that person who whispers and reminds every one of the weird girl in Pitch Perfect who ate her twin in the womb. Speak clearly and loudly enough to be heard by the whole class. It is easier for everyone and the professor will much prefer not having to decipher your whispering mumbles. For heavens sake, converse with the professor in a respectful manner. Don't be sassy or grouchy and don't try to use humor to get out of answering the questions. Just respectfully provide them with the best answer you can formulate. Nothing drives me crazier than listening to students talk back to professors or get sassy with them.... I was taught to respect my teachers and if they are giving me a grade, I will certainly be respectful. Every professor I have had thus far told us in the beginning of class, if you do not have the answers, did not read and are not prepared- just tell them. They prefer that to wasting their time on you as you attempt to formulate wrong answers or fake your way through it. News flash, they can tell when you have not read the case and it annoys them (and the rest of the class) when you try to pretend otherwise. However, it is best to just avoid this situation by preparing properly for class. But professors are people too and they understand that sometimes life happens and you are unable to read. They have a lot more sympathy when you respectfully tell them that ahead of time versus listening to you try to fake it. Faking it also is just embarrassing- the rest of the class will be judging you and you don't want to be "that" person. As the semester goes on and you get cold called multiple times, it gets easier and easier. Like anything else, it is a learned an acquired skill. Also, you start to learn how each individual professor questions and what they are looking for in answers. I suggest listening closely the first few classes to how the professor cold calls even if it is not you- it will give you a better idea of what to expect when the questions turn on you. Every professor is different and expects different things but it is usually easy to learn that pattern after a few classes. Cold calls really aren't that bad. As long as you are prepared for class, speak respectfully and clearly and answer the question asked, it will be smooth sailing. Not to say that your heart won't skip a beat when the first professor calls out your name but these tips will have you prepared for the challenge.